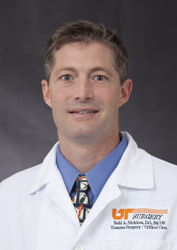 Todd Nickloes, DO, FACOS, FACS, Associate Professor of Surgery's Division of Trauma/Critical Care, has been named Program Director of the Surgical Critical Care Fellowship at the UT Graduate School of Medicine. He succeeds Brian Daley, MD, who served as Program Director since 2011 and continues serving as the General Surgery Residency Program Director. Dr. Nickloes is a graduate of the Surgical Critical Care Fellowship at UT Graduate School of Medicine and has been on faculty since completing his fellowship in 2000. He is well respected in his field nationally, serving on several association boards and committees. For the American Board of Osteopathic Surgeons, he is currently serving on the Board of Governors, the Bureau of Osteopathic Education, the Continuing Education Committee and the General Surgery In-service Exam Committee. For the Eastern Association for the Surgery of Trauma, he serves on the Publications Committee and Pediatric Trauma Ad Hoc Committee. He also serves on several committees within The University of Tennessee Medical Center including the Transfusion Committee and ER/Trauma Performance Improvement Committee. His clinical focus is in biliary/pancreatic pathology, surgical critical care, and phrenic nerve paralysis, and his research focus is pancreatic pseudocyst management, PEG tube management, massive transfusion protocols, and phrenic nerve paralysis. Dr. Nickloes is well published, including a book chapter and several peer reviewed journal articles. He also serves as an Independent Reviewer for theÂ Journal of Laparoendoscopic Surgeons. The Division of Trauma and Surgical Critical Care is organized to provide continuity of care throughout the course of the acutely injured or critically ill surgical patient.Â The fellowship is one year for Surgical Critical Care and two years when combined with Trauma. The fellow must be board certified or board eligible in General Surgery.